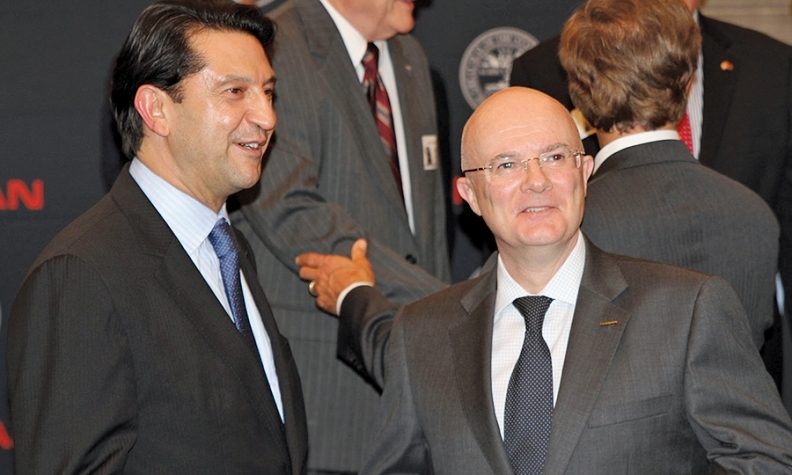 Nissan North America Chairman Jose Munoz, left, and manufacturing chief John Martin at the supplier park announcement in Nashville. "I'm just trying to make it easy for suppliers to expand. Why? Because I want them to move here. I want them closer. And if they want to use our building to expand to other customers, that's fine with us." NASHVILLE -- In hopes of wooing more Midwestern parts makers to its side in Tennessee, Nissan says it will allow them to supply other automakers from under the roof Nissan will put over their heads. Nissan said this month that it will spend $160 million -- with the State of Tennessee providing another $35 million -- to construct a 1.5 million-square-foot supplier building next door to its ever-growing assembly plant in Smyrna, Tenn. The building is expected to open in 2016, with 10 suppliers initially employing about 1,000 people. Nissan is not yet identifying the 10 suppliers, except to say that they represent "large and complex parts." The plan: Participating suppliers will be free to use Nissan's building to serve Nissan's competitors. "I have no objection at all to suppliers using this site to supply other auto companies," says John Martin, Nissan North America's senior vice president for manufacturing, supply chain management and purchasing. "The suppliers will have privacy rights on my site, and they will all be enshrined in the contracts we sign. "I'm just trying to make it easy for suppliers to expand," Martin says. "Why? Because I want them to move here. I want them closer. And if they want to use our building to expand to other customers, that's fine with us." Supplier parks are nothing new. In fact, Nissan itself helped pioneer the idea of on-site suppliers in 2002 at its then-new assembly plant in Canton, Miss. But the concept has been challenging, mostly for one reason: Suppliers find it difficult to justify opening a manufacturing site that is completely reliant on the volumes of a single customer program -- especially in the aftermath of the 2008 industry crash. Supplier parks have been touchy competitive propositions, says Kim Hill, who follows supplier locations as a director of the Center for Automotive Research in Ann Arbor, Mich.
"Nissan is being very explicit in their agreements in allowing suppliers to do this," Hill says. "But there are still issues to overcome. This industry can be a little paranoid. A competing automaker might look at my operation inside Nissan and say, 'You're obviously in Nissan's pocket. How can we trust you to work on our development project when Nissan is right there watching?'" Martin is eager to address that concern head-on. "There are certain rights that suppliers must have and should have on confidentiality, and we're happy to deal with that," he says. "But I go onto supplier shop floors every week, and I can see other OEMs' parts being made. My competitors see my parts being made. What's the difference? We're not precious about that. Suppliers are good at managing the confidentiality they need." Nissan's hope is that by bringing suppliers close to its assembly lines, it will reduce transportation expenses and the cost of work-in-transit, or having days' worth of production parts sitting on trucks or in warehouses. Martin says there are other potential cost savings -- not the least of which is allowing suppliers to rent Nissan space rather than invest money in land and plant construction. Nissan says it will spend $160 million to build a supplier building next to its assembly plant in Smyrna, Tenn. It is expected to open in 2016 with 10 suppliers initially. "Here's our argument," Martin says. "The industry is near a volume of 17 million units a year. An awful lot of our suppliers are running out of capacity because they retrenched severely during the recession. "So I'm asking them, 'Why are you investing in the North? Why aren't you nearer to me? I'm the biggest auto plant in America!'" The Smyrna plant produced 648,000 vehicles last year. "If you're going to expand, why are you doing it where you are and incurring transportation costs to move all your materials from the Midwest, Wisconsin, Illinois, Kansas? If you do it next door to me, you're going to be a much more compelling choice for me to source from." 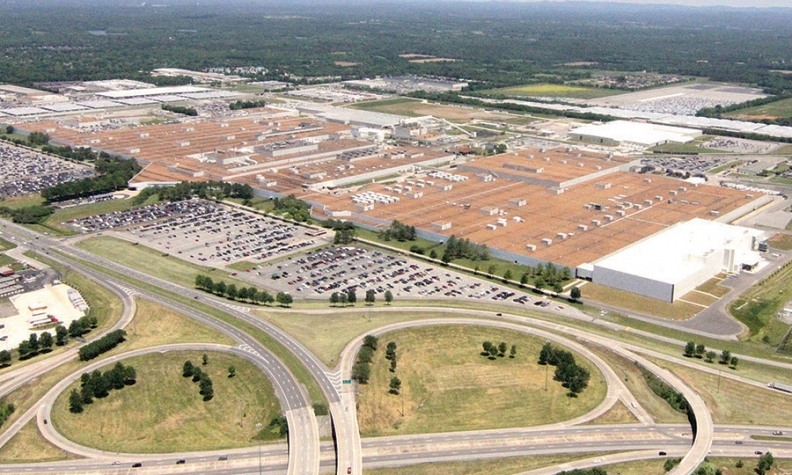 Separately, Nissan also is constructing a large worker-training campus on its Smyrna property, paid for with state funds, to turn out automotive-skilled workers for its own assembly lines as well as for any other automotive company in the area. "There's going to be glitches," Martin says. "But once you have an element of fairness in the occupancy contract, a lot of issues will fall away. "We're not going to try to make a margin out of the park. We're not interested in that at all. We're not in the commercial real estate business. I need the suppliers to capture the commercial advantage of it."